The Drawer Boy is based on the multi-award-wining 1999 play by Michael Healey, one of the most produced plays in Canada and the U.S.A. The story centres on Miles, a young theatre actor from Toronto who arrives in Huron County (Ontario) at the home of Angus and Morgan, two aging bachelor farmers. Miles stays with the two farmers in order to gather stories about rural life and make a play about it. Miles strikes a chord with Angus, who suffers memory loss from brain damage sustained in the World War Two, and constantly has to reintroduce himself. One night, Miles overhears Morgan retelling Angus the story of their friendship, the women they loved and how they came to live in Canada. His play complete, the lives of all three men are irrevocably altered when art attempts to imitate life and the line between truth and fiction is crossed. Although the clash between rural shrewdness and urban naiveté initially makes this film a comedy, the story ultimately evolves into a compelling drama of loyal friendship, lost love and abiding devotion. This is the first time The Drawer Boy has been adapted to film. 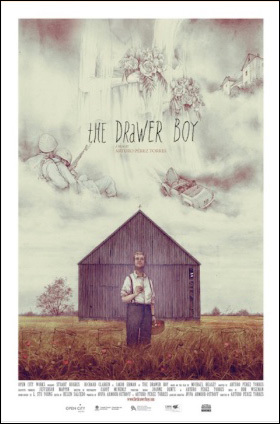 The Drawer Boy has won over twelve awards at international festivals, including Best U.S. Premiere at Heartland Film Festival, Critic’s Choice at Morelia, Best Feature at The Anchorage International Film Festival, Best Adapted Screenplay at Sedona International Film Festival, Best Feature at the 2018 Canadian Film Fest and the ACTRA Award for Outstanding Performance for Stuart Hughes.